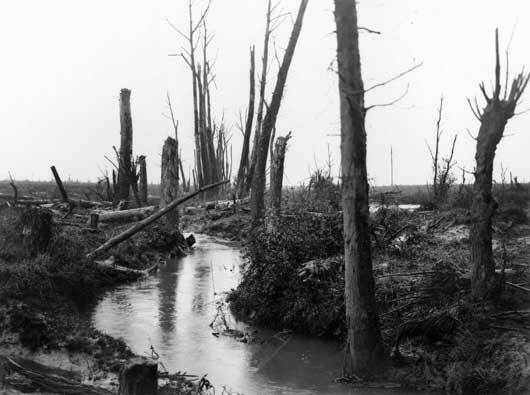 The Battle of Messines began on 7 June 1917 with the objective of capturing the Messines-Wytschaete ridge south of Ypres where there was a large enemy salient, or bulge, into the Allied lines. If the line was not straightened here, the planned attack towards the east from Ypres would create an ever lengthening German line to the south from which artillery could fire into the British flank. For what became known as the Battle of Messines, the British prepared the most detailed plan ever for a major British offensive. Artillery targets were carefully plotted and an immense creeping barrage of artillery and machine-gun fire was designed to move ahead of the infantry. Huge models of the ground were built and studied by the troops, especially those in the Third Australian Division commanded by Major General John Monash. For two years British and German tunnelling companies had manoeuvred and fought an underground war in the Messines area. The British succeeded in concealing from the Germans that they had pushed 19 tunnels deep below the German front-line trenches. From November 1916, the oldest mines, three kilometres south-east of Ypres at Hill 60, were the responsibility of the 1st Australian Tunnelling Company. 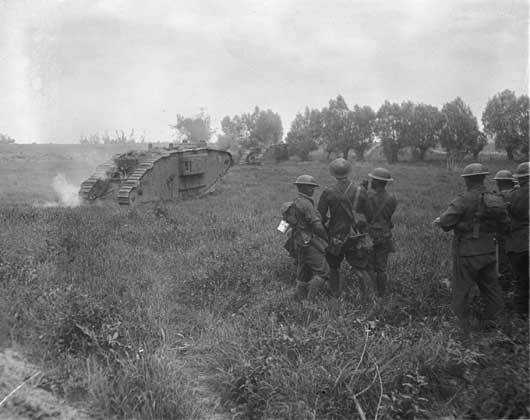 The 3rd and 4th Australian Divisions took part in this battle. It was the first battle for the 3rd Division and the first for its commander, General John Monash, in charge of a division. The attack commenced with the explosion of the 19 mines and within three hours the entire ridge was taken. The Battle of Messines was a ‘stunning success’. It removed the German salient south of Ypres and paved the way for the offensive east of Ypres to commence on 31 July 1917. However, the two Australian Divisions suffered nearly 6800 casualties. 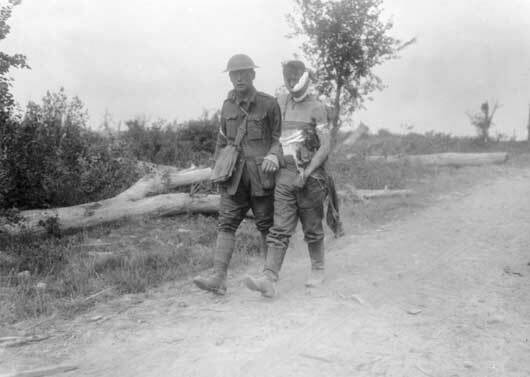 An Australian stretcher bearer assisting a wounded German prisoner during the Battle of Messines (AWM E00481). 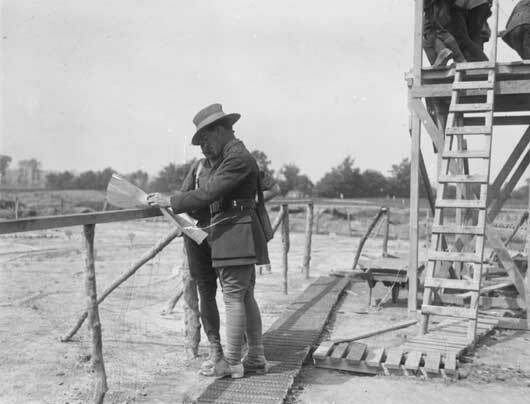 Captain Albert Jacka VC, 14th Battalion, comparing his maps with the prepared model of the Messines area, the day before the advance (AWM E00631). 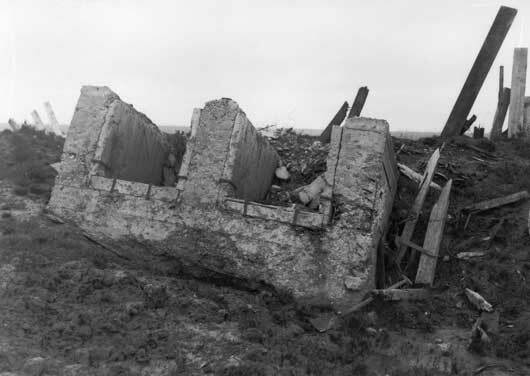 A German pillbox, overturned by the explosion on Messines Ridge (AWM E01269). A view of the Douve River, looking towards La Potterie Farm near Messines in Belgium (AWM E01292). Unidentified New Zealanders watching the tanks advancing towards Messines Ridge (AWM E01417). 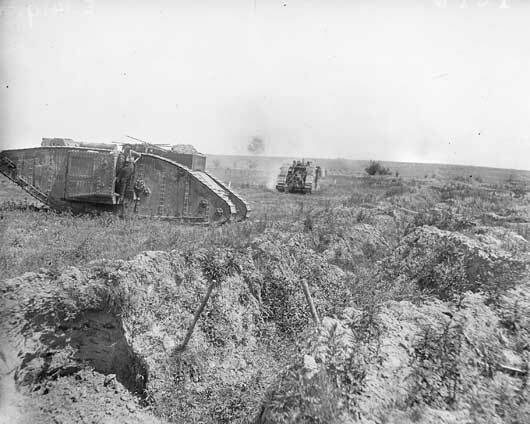 Two tanks on their way into action during the attack on Messines Ridge, as shells burst in the background (AWM E01419). 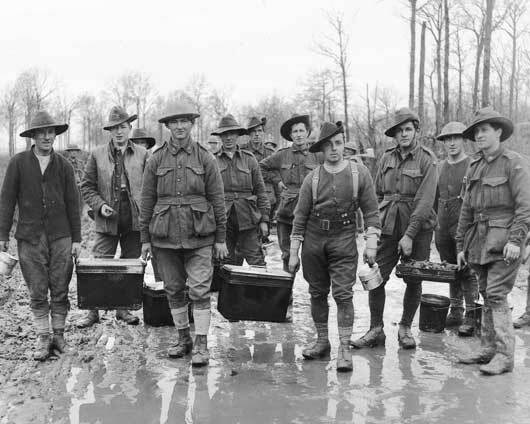 Mess orderlies of an Australian unit conveying hot soup to reserve troops near Hyde Park Corner, in the Messines Sector (AWM E01512). 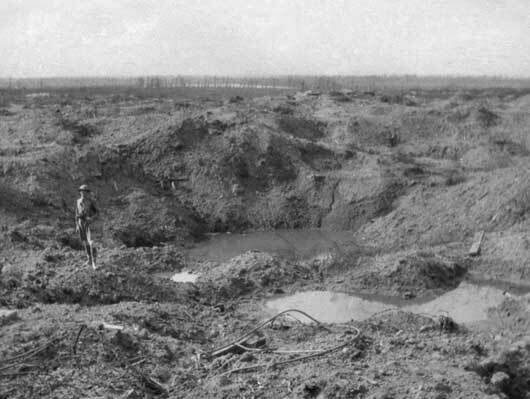 Looking from an old crater on the north side of Hill 60, over shell-pitted ground towards Zillebeke Lake (AWM E01911).